A bake full of sunshine and colour. For the pastry: Rub the butter and the flour together by hand, using your finger tips. The mix should look like large bread crumbs. Add the whole whisked egg and the sugar. Bring all the ingredients together to form a ball of pastry. Wrap in cling film and chill for at least 20 minutes. For the crème patisserie: Whisk the egg yolks and sugar together in a bowl until pale and light. Fold in the corn flour and flour. Bring the milk to the boil in a small saucepan and then whisk it gradually into the egg mixture. Pour the mixture into a clean pan and bring it slowly to the boil until it thickens. Simmer for a minute and then take the pan off the heat. Pass through a sieve. Split vanilla pod in half length ways, scrape out the seeds and add to the mixture. Cover with cling film and allow to cool. Then place in a piping bag. Pre heat oven to 170 degrees C Roll out pastry to about 4mm thick. Carefully line the four tartlet tins. Leaving an over hang of pastry. Place on a baking tray. Chill for twenty minutes. Blind bake pastry for ten minutes. Turn down oven to 160 degrees C Remove baking beans and prick pastry with a fork and cook for a further ten minutes. Egg wash tarts and cook for a further five minutes. Remove from oven and allow pastry to cool in the tins. With a small edged serrated knife, trim the excess pastry from the tins. Being very delicate. 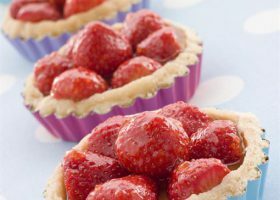 Remove pastry cases from tartlet tins. Pipe in the crème patisserie. Hull three strawberries slice them three quarters the way down, so the slices are still connected. Fan out strawberries, arrange on top of the crème patisserie. Dust with icing sugar.